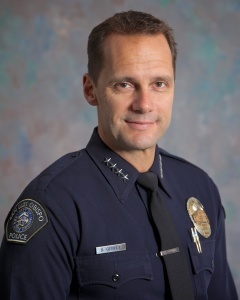 Earlier this year, Gesell applied to Chico for its chief of police position. On May 12, SLO City Manager Katie Lichtig placed Gesell on paid administrative leave, and last week the city agreed to pay him a $120,000 settlement to walk away without disparaging or filing a lawsuit against the city. On May 22, several members of Chico’s Police Officers Association were in San Luis Obispo to interview Gesell’s former associates as part of a background investigation. Gesell responded by withdrawing his application for the Chico chief of police position. In 2013, a judge ruled that Maricopa County Sheriff Joe Arpaio’s office had systematically racially profiled Latinos in its regular traffic and immigration patrols. Arpaio leadership has cost Maricopa County taxpayers more than $23 million in legal expenses and the costs of implementing court recommendations to fix Arpaio’s acts of racial bias. Gesell told KSBY he is contemplating running for the sheriff’s seat currently held by Arpaio in the 2016 election. Get links to local news stories, like CCN on Facebook. In spite of his drawbacks, Gesell is light years ahead of the knuckle-dragging barbarian hired by Jim App, the City Manager (cough cough) of Paso Robles. I looked at the date — it’s not April 1. Surely this is some sort of joke? There’s gotta be a fake ‘reality’ TV show deal in this somewhere. Maybe “19 lies from Gesell and Counting”…. If they will hold my hand. Gesell isn’t even qualified to tie Sheriff Joe’s shoelaces. I’m spending a little to much time in “Cyber lah lah” land and really do need to get back to something more substantial. Hot Topic 82 likes. Never happen with me. This Country has changed a lot. Culturally I believe I’m in a third World Society. Seriously. I have an English translation Quran and have warmed up to it. I’ll never burn my copy. My reference earlier to the Muslims in part has to do with there is a Mosque near the Police Station. I urge these Muslims to cleanse and purify themselves thoroughly of all the corruption and filth in this community. I would not want to interact with it. I’m serious if this apathy which has allowed a corrupt and seriously distorted Legal System to flourish coupled with a potentially enormous capacity for surveillance continues, Sharia Law might start looking like an alternative. Hopefully, I will have croaked by than. I think some of you are wet behind the ears, back in the 1950’s or something? I’m somewhat of a Religous fanatic in my own right. Study my Greek, Sanskrit, Avestan and be left the hell alone. When I’m being interfered with I get testy and adversarial. Apparently I need to review this mythological document known as the Constitution and see what standing I have if any. Muslims: Lawyers, Judges, Police, you can have all of them; please take them. What are you talking about??? Completely off topic … Mosques and sharia law? I hope the moderator gives you the hook … you make no sense … Meds? You don’t like Muslims or what? Least I’m not simple minded and boring. I get it you’re sitting around at the station or in the patrol car. Get off the social media and go deal with crime. You’re on the clock right? At least you could do is introduce yourselves, anonymity is for cockroaches. We need more meter maids than Police for all the crime you prevent. I may be off topic but I’m not stupid. I don’t like you either.